Is it Time for Socialized Banking? If the public is going to have to fund the wall street package to the degree that many are assuring us will be necessary, why shouldn’t the public be on the receiving end when there are profits. I don’t mean to speak rhetorically, but there are some problems with this whole scenario as it seems to be playing out today — with the congress not passing the bail out package as it stands at the moment, and the Dow Jones dropping a precarious 700 points. stand by for more… . 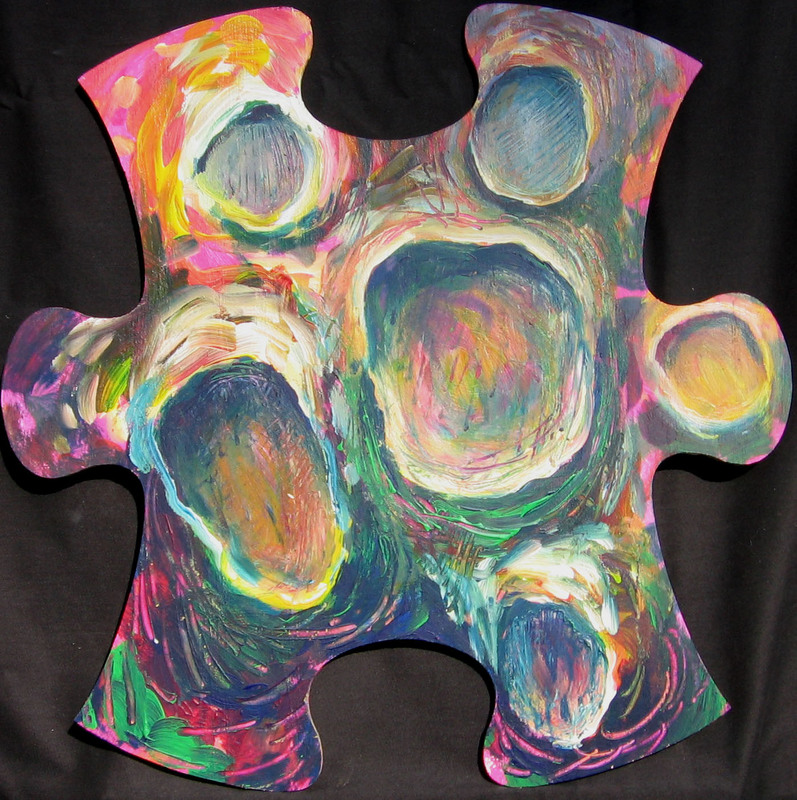 My puzzle piece will hang with the batch done in our correctional ctr art classes. VT Council on the Arts gave me 20 of the blank wooden cut out pieces. The completed pieces will be on display at the UVM Davis Center very shortly. For those of us who have been paying attention all along, you were great. For some you may have solidified their vote. But for those who may be just starting to focus on campaign season and may be confused or otherwise not sure which way the wind blows, and especially for those not gifted or curious in the politics department, you may be coming at them with too much fuel but not enough fire. One of your strengths in contrast with McCain is that you seem to be one who maintains his cool; so how to get enough passion across to engage those who may miss the sublety and nuance of your message, while maintaining your cool is the challenge. more later– I gotta go for a walk. What’s good for the goose is good for the gander, no? so why would we want to tether ourselves to a note that will cost each of us individual taxpayers 8 or 10K, not counting interest, to help out the rich bank owners who have already helped themselves to plenty? Tell Congress NO to the 700 billion dollar blank check –that we need a solution that helps main street folks as well as the greedy, self -servingWall Street folks. Make the people who got rich while creating this crisis pay for the recovery. Demand a recovery that addresses fundamental flaws in the system, and includes regulatory oversight so that this will never happen again. Is this the October surprise? Listen to Thom Hartmann and Bernie Sanders discuss today. We’ve Got to Swing that Pendulum Back the Other Way! Put $10 on your credit card to Obama, because he needs to set the record straight. go to actblue.com and donate to Obama. The poll is running strongly to the yes (that she is qualified). I don’t think the word is getting out that she’s a liar and a right wing religious extremist wacko who would remove biology from the curriculum and replace it with creationism. Let’s turn this around. Please go cast your vote here on the PBS site. And then, pass the word along. Things are downright depressing. Are we really going to let Mccain and Palin take the election? Mad Men you’ve heard about it: the tv show based on the late 50’s-1960 ad men and their personal lives. I guess Mad is short for madison ave. Anyway, I’ve just watched the first three episodes of the first season (2007). The costume, set design and camera work were flawless; the casting, story and script, sublime. So why does the overall effect seem a little thin? I appreciate that the pacing of shots and the action are a little more relaxed as would befit the times. One thing that lacks is an ambiance that could be better given to us by a more robust soundtrack. For example, a smattering of Elvis, who was huge then, the Drifters, the Platters, the Everly Brothers, Bobby Darin, and for heaven’s sake, the twist! Let it rip. Another thing that occurs to me as missing, and I don’t think it’s too early in the series to expect this, are signs of the main character’s creativity. Don Draper doesn’t seem to have any tell tale signs of a creative genius except the drinking. When I think of the more creative folks I’ve known, they haven’t often had the most conventional life and been so low affect. An artist– broadly understood as anyone working with and relying on their creative juices– works with a concentration of the whole personality, the conscious and sub-conscious parts. Draper appears to be coasting on suave, and a pinch of sales ability. But perhaps we can chalk that up to the ultra conformicizing pressures of the times. In any case, on the evening of the show’s Best Drama Emmy award, I am excited to know that there are many more worthy episodes to see in the future. 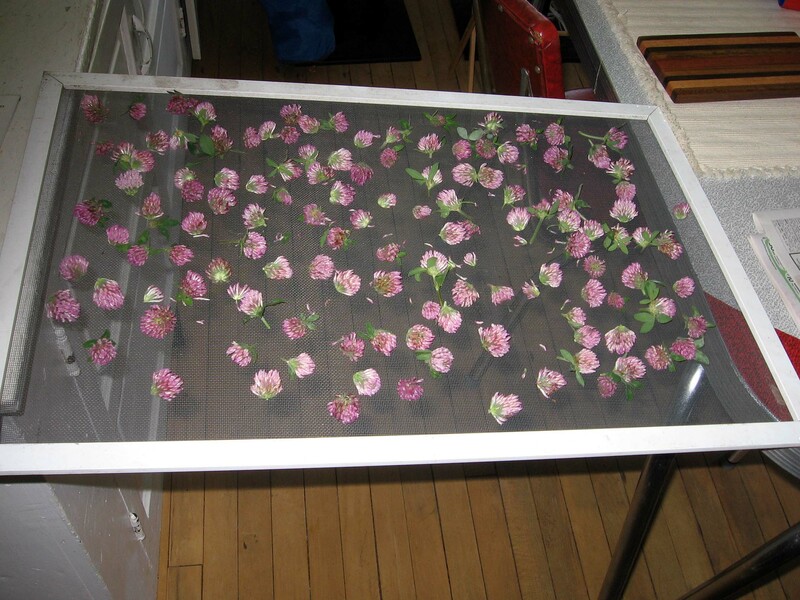 Drying on screen might get me best results. The first batch I did a few weeks ago, and they browned quite a bit. I’m htinking that because we had so much rain in July, they had a higher moisture content. what is it about red clover? according to the higher authorities, it provides a boost for the liver function, helps in lymphatic flow and strengthens the lungs. And I have also read that there is some help with the mitigation of symptoms that are particular to women of a certain age, such as hot flashes and other problems caused by hormonal changes. Damien Hirst — what gives with the art world? I must be just plain naive. No wonder the art/cultural world drips with irony. How can we take anything seriously when Damien Hirst’s stuff is going for millions and millions. I just don’t get it. The deliberately provocative has been with us since ??? …the sixties? What feeds this strange market. Market driven art-making is not new, but with the dumbing down of a general population, with little to no art, or art appreciation being taught in schools any more, and a post modernism that takes it’s worst position in the anything goes sentiment, it seems that the snake can go on eating its own tail forever. I promise I’ll try to pick out some artworks I like and comment on them soon, so that I don’t seem to be crankish about everything all the time… (smile). You are currently browsing the Arugulayumyum's Weblog blog archives for September, 2008.